Snowflakes are agglomerates of many snow crystals. Most snowflakes are less than one-half inch across. Under certain conditions, usually requiring near-freezing temperatures, light winds, and unstable, convective atmospheric conditions, much larger and irregular flakes close to two inches across in the longest dimension can form. No routine measure of snowflake dimensions are taken, so the exact answer is not known. See also the NOAA Question of the Month: How do snow flakes form into so many uniquely different shapes? Generally, snow and ice present us with a uniformly white face. This is because most all of the visible light striking the snow or ice surface is reflected back without any particular preference for a single color within the visible spectrum. The situation is different for that portion of the light which is not reflected but penetrates or is transmitted into the snow. 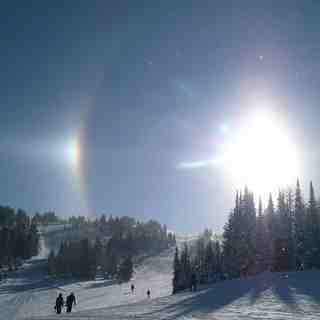 As this light travels into the snow or ice, the ice grains scatter a large amount of light. If the light is to travel over any distance it must survive many such scattering events, that is it must keep scattering and not be absorbed. The observer sees the light coming back from the near surface layers (mm to cm) after it has been scattered or bounced off other snow grains only a few times and it still appears white. However, the absorption is preferential. More red light is absorbed compared to blue. Not much more, but enough that over a considerable distance, say a meter or more, photons emerging from the snow layer tend to be made up of more blue light than red light. Typical examples are poking a hole in the snow and looking down into the hole to see blue light or the blue color associated with the depths of crevasses in glaciers. In each case the blue light is the product of a relatively long travel path through the snow or ice. So the spectral selection is related to absorption, and not reflection as is sometimes thought. In simplest of terms, think of the ice or snow layer as a filter. If it is only a centimeter thick, all the light makes it through, but if it is a meter thick, mostly blue light makes it through. No, it can snow even at incredibly cold temperatures as long as there is some source of moisture and some way to lift or cool the air. It is true, however, that most heavy snowfalls occur with relatively warm air temperatures near the ground - typically 15°F or warmer since air can hold more water vapor at warmer temperatures. Snow forms when the atmospheric temperature is at or below freezing (0 Celsius or 32 Fahrenheit) and there is a minimum amount of moisture in the air. If the ground temperature is at or below freezing, of course the snow will reach the ground. However, the snow can still reach the ground when the ground temperature is above freezing if the conditions are just right. In this case, snowflakes will begin to melt as they reach this warmer temperature layer; the melting creates evaporative cooling which cools the air immediately around the snow flake.This cooling retards melting. As a general rule, though, snow will not form if the groud temperature is 5 degrees Celsius (41 deg Fahrenheit). For a more detailed answer, see When is it too warm to snow?, Texas Climate Bulletin). Why can snow fall when temperatures are above freezing? Snow forms in the atmosphere, not at the surface. So snow can fall when surface temperatures are above freezing as long as atmospheric temperatures are below freezing and the air contains a minimum moisture level (the exact level varies according to temperature). Does snow always get fluffier as temperatures get colder? o. Studies in the Rocky Mountains have shown that the fluffiest, lowest density (0.01 - 0.05) snows typically fall with light winds and temperatures near 15°F. At colder temperatures, the crystal structure and size change. At very cold temperatures (near and below 0°F) crystals tend to be smaller so that they pack more closely together as they accumulate producing snow that may have a density (water-to-snow ratio) of 0.10 or more. Is it true that there is one inch of water in every ten inches of snow that falls? The water content of snow is more variable than most people realize. While many snows that fall at temperatures close to 32oF and snows accompanied by strong winds do contain approximately one inch of water per ten inches of snowfall, the ratio is not generally accurate. Ten inches of fresh snow can contain as little as 0.10 inches of water up to 4 inches depending on crystal structure, wind speed, temperature, and other factors. The majority of U.S. snows fall with a water-to-snow ratio of between 0.04 and 0.10. Fresh, undisturbed snow is composed of a high percentage of air trapped among the lattice structure of the accumulated snow crystals. Since the air can barely move, heat transfer is greatly reduced. Fresh, uncompacted snow typically is 90-95 percent trapped air. How much snow falls where I live? Sioux City, Iowa receives approximately 30 inches in an average year with roughly six inches falling each month from December through March. To check snowfall amounts for your area of the United States, see the average snowfall total table for hundreds of American cities and towns (provided by the National Climatic Data Center). How much snow has fallen in a single day? Seven days? A month? For snowfall amounts in the United States, see the National Snowfall and Snow Depth Extremes Table provided by the National Climatic Data Center. Clean snow is certainly edible. Snow in urban areas may contain pollutants that one should not eat but they would probably be in such low concentrations that it might not matter. Still, eating snow should be restricted to "wilderness" areas. Sometimes snow contains algae which gives it a red color. This snow can be eaten and some say it actually tastes "good" but we have never tried it. Why is snow colder in deeper spots? Snow is not necessarily colder in deeper spots. The temperature at the surface of the snow is controlled by the air temperature. The colder the air above the colder will be the snow layers near the surface, say within the top 12 to 18 inches. The snow near the ground in deeper snowpacks however is warmer because it is close to the warm ground. The ground is warm because the heat stored in the ground over the summer is slow to leave the ground because snow is a good "insulator," just like the insulation in the ceiling of your house, and thus slows the flow of heat from the warm ground to the cold air above. Why is snow deep in spots and not others? Why do more icicles form on the south sides of buildings? Icicles form as the result of cycles of melting and freezing. Typically this cycle will occur more often on the south sides of buildings, melting in the day and freezing at night, whereas on the north sides, without the benefit of the warmth of the sun, melting does not occur as often. but snow forecasting remains one of the more difficult challenges for meteorologists. One reason is that for many of the more intense snows, the heaviest snow amounts fall in surprisingly narrow bands that are on a smaller scale than observing networks and forecast zones. Also, extremely small temperature differences that define the boundary line between rain and snow make night-and-day differences in snow forecasts. This is part of the fun and frustration that makes snow forecasting so interesting. What is a winter weather watch? warning? advisory? NOAA's National Weather Service issues Winter Storm Outlooks when forecasters believe there is a good chance of a major winter storm. A Winter Storm Watch is issued to alert the public to the possibility of a blizzard, heavy snow, heavy freezing rain or heavy sleet. Winter Storm Warnings are issued when a hazardous winter weather event is imminent or occurring, and is considered a threat to life and property. Finally, a Winter Weather Advisory is issued for accumulations of snow, freezing rain, freezing drizzle and sleet that will cause significant inconveniences and, if caution is not exercised, could lead to life-threatening situations. For a more detailed answer to this question, see the NOAA Question of the Month: Winter Weather Watches, Warnings and Advisories - What do they all mean? For definitions of sleet, snow, snowflakes, snow flurries, snow grains, snow pellets, hail, soft hail, and other forms of precipitation, see the precipitation definitions in USA TODAY's Weather Book. Can there be thunder and lightning with a snow storm? Thunder and lightning can be associated with snowstorms but they are rare and occur more often near the coast. For a more detailed answer, see The New York Times Learning Network's Thunder Snow. For a more technical explanation, see the NOAA/National Severe Storms Laboratory's paper titled, Thunderstorms observed at surface temperatures below freezing across North America. Yes, when the ground has a thick layer of fresh, fluffy snow, sound waves are readily absorbed at the surface of the snow. 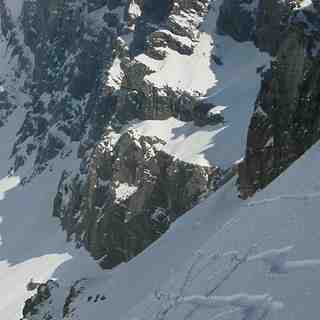 However, the snow surface can become smooth and hard as it ages or if there have been strong winds. Then the snow surface will actually help reflect sound waves. Sounds may seem clearer and travel farther under these circumstances. Why does snow crunch when you step on it? At what temperature does it crunch? Snow is made of ice crystals. Ice crystals have six points. One snowflake can consist of multiple crystals. There are gaps between the points of a crystal that are empty, except for air. When snow falls to the ground, air is trapped inside of that layer of snow. You have probably noticed that when snow is stepped on, it gets compressed. The air gets pushed out of the snow. The sound you hear could be the sound of the ice crystals as they break. Try it with ice cubes. They make a crunching sound when they are broken. Also, on a sunny day, the surface layer of snow can melt, due to thermal heating. When the sun goes down and temperatures drop, that top layer refreezes into a thin crust of ice. If you step on it, you are breaking that top crust, resulting in a "crunching" sound. The crunching sound is less related to temperature and more related to the structure of the snow. The older the snow, the more compacted and icy it becomes. Lake effect snow is "snow showers that are created when cold dry air passes over a large warmer lake, such as one of the Great Lakes, and picks up moisture and heat." For a more detailed answer to this question, see the NOAA Question of the Month: What is Lake Effect Snow? See also NSIDC's list of lake effect snow sites. A mineral is a naturally occurring homogeneous solid, inorganically formed, with a definite chemical composition and an ordered atomic arrangement. Based on that definition, I'm sure you can determine that ice is a mineral. Ice has a definite chemical composition (H20). It is naturally occuring given a temperature below 0 deg C. It is homogeneous (of one material), formed inorganically, and has an ordered atomic structure (hydrogen and oxygen atoms bonding in a specific manner).